As a musician, I am always looking for ways to save space and money. This means that I like to download useful music apps to my phone or computer so that I don’t have to pay so much money or carry around a lot of stuff. I have apps that I use for my own particular practice as well as other productivity related apps. Technology is such an important part of our daily lives, and it only makes sense to include technology in our musical lives. Most of these apps are free, and some are for mobile devices while others are for laptops. Here are my favorite music apps. This free app is amazing! It is basically a three-in-one tuner, metronome, and audio recorder. 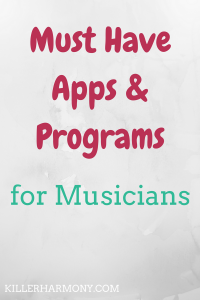 I use this app whenever I need to check tuning or work on the tempo of a piece. I have also used the recorder a little bit, but I need to use it more. I have this app on my iPhone, so you can download it from the App Store, but I am not sure if you can get it on an Android. If you can’t, be sure to check Google Play for other tuner, metronome, and recorder apps! Having those tools digitally means you don’t have as much to carry around. If you want to listen to recordings of your music, YouTube and Spotify are two of the most common ways to do that. You can find so many different recordings of most pieces, and they’re free. I use YouTube to find my recordings, and it’s really convenient. I can even make a playlist of repertoire to work on if I want. Spotify is another good app, but it doesn’t have the video capabilities of YouTube. Watching people play is another good way to learn a piece. As far as I know both apps are available on all platforms, mobile or otherwise. They have free versions as well as paid subscriptions. Listening to your pieces will give you ideas on how to interpret the music you are learning. Your ear is your best tool. There is a massive community of musicians on Instagram. You can post photos and videos as well as interact with others. Follow accounts that you enjoy, and like and comment on others’ posts. Instagram is a great way to start building a presence online as well as build a portfolio of your playing. Social media is becoming more and more crucial to a musician’s success. The internet is growing, and it is more important than ever to network and connect with others. Facebook is another social media platform, but it is also another way to connect and build an audience. With Facebook, you can use the written word to meet other musicians and contact potential clients. Join Facebook Groups for musicians and for players of your instrument. It’s a great way to learn from others and to share your own knowledge. If you network correctly, you can definitely make a name for yourself. Canva is a free, easy graphic design program. You don’t need to be a designer to use it. If you need to edit photos or create a poster to promote an upcoming concert, Canva is for you. You have the freedom to create so many different designs, and you can actually feel like a designer. I love using Canva, and that is actually where I create a lot of the images on this blog. Canva is so simple, and I think everyone should use it. There is a website for desktop use as well as a mobile app for on the go designing. I love having some sort of app that can read and display PDFs, especially on my iPad. Sometimes, you might want to download sheet music, so you need to be able to see it so that you can print it or use a table to read it and play. I love using my iPad to download sheet music for sight reading. That way, I don’t have to waste time and paper to print music that I probably won’t use again. You can use any app that can read PDFs for this, So odds are you already have something. Do you have any favorite music apps? Let me know in the comments! Previous Previous post: Should You Major in Music?